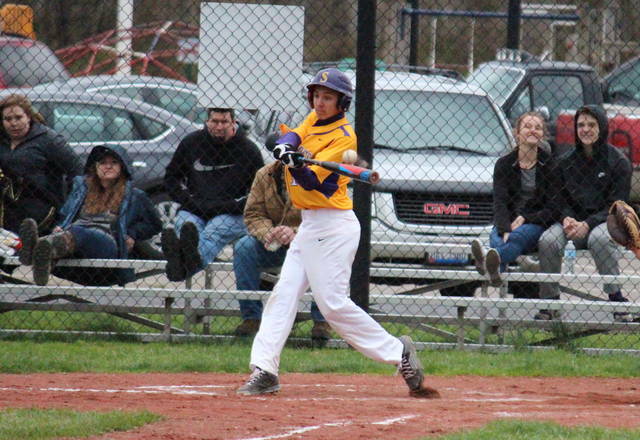 Southern junior Billy Harmon hits a double in the second inning of the Tornadoes’ 28-1 victory on Friday in Racine, Ohio. RACINE, Ohio — The Tornadoes created quite a whirlwind on the base paths. 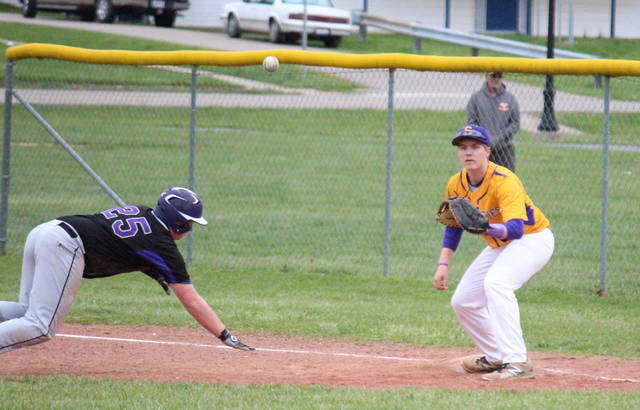 The Southern baseball team had 38 base runners on Friday night, as the Purple and Gold routed Tri-Valley Conference Hocking Division guest Miller by a 28-1 count at Star Mill Park. Southern (2-1, 2-1) combined five hits with two errors, a walk and a hit batter in the opening inning, bringing home six runs. The Tornado offense exploded for nine runs in the second inning, teaming six hits with five free passes and an error. Southern’s lead grew to 21-0 in the bottom of the third, crossing the plate six times after five hits, two errors, a walk and a hit batter. Miller scored its only run of the game in the top of the fourth inning, as Bartley reached on an error and scored on another error. Seven consecutive walks, followed by a pair of hits brought seven Tornadoes in to score in the bottom of the fourth to cap off the 28-1 win. Dylan Smith earned the pitching victory in two innings on the mound for Southern, striking out two, walking two and allowing one hit. Coltin Parker tossed two innings in relief, allowed one unearned run and three hits, while striking out four. Ryan Laudermilt pitched the final frame, struck out one batter and hit one. Vollmer suffered the loss in one inning on the mound for the Falcons. Smith, Gage Shuler, Cole Steele and Ryan Acree each had two hits for the SHS offense, with Smith, Acree and Steele each earning three RBIs, and Shuler picking up one RBI. Smith scored three runs, Shuler scored twice, while Acree and Steele both scored once. 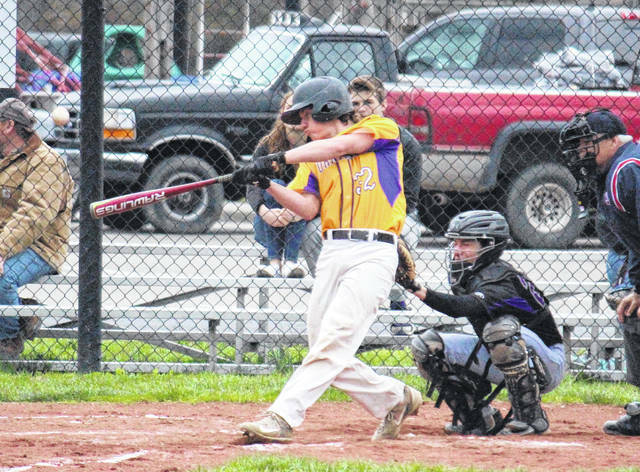 Auston Colburn, Garrett Wolfe, Logan Drummer, Josh Tanksley and Billy Harmon each doubled once, with Harmon and Colburn both scoring twice and driving in two runs. Wolfe, Tanksley and Drummer each scored once, with Wolfe and Tanksley each earning an RBI. Parker, Jensen Anderson, Kyeger Roush, Dakota Kowell, Joey Weaver and Jacob Milliron each singled once, with Milliron and Weaver each scoring twice. Anderson, Roush, Kowell and Parker scored a run apiece, Parker, Anderson and Kowell had each had two RBIs, while Roush and Weaver both drove in one run. 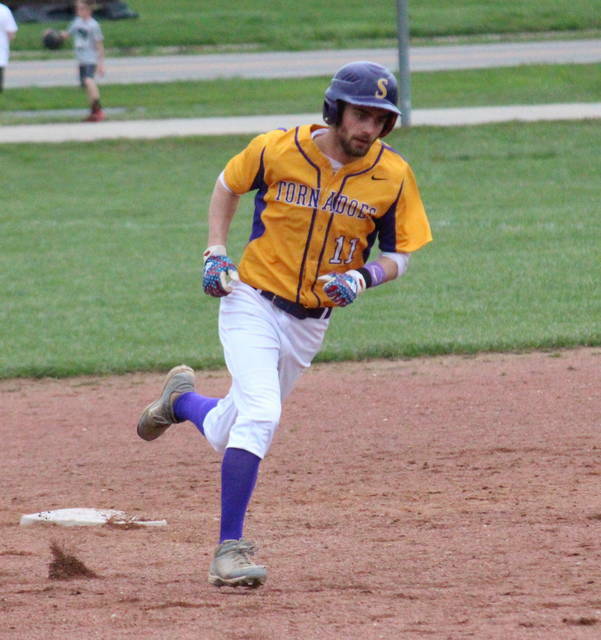 Logan Dunn and John Ginther each scored twice, while Laudermilt and Lance Stewart both crossed home plate once for the Purple and Gold. Greenich had two hits for the Falcons, while Vollmer, Thompson and Hettich each had one. Southern committed three errors and stranded 10 runners on base, while Miller had six errors and six runners left on. Southern will try to sweep MHS on April 25 in Hemlock. After canceling Saturday’s non-conference bout against Meigs, Southern is set to meet Trimble on Monday.